Neil Maes, 11, of Belton, S.C., smiles while he is interviewed at The Alexander Graham Bell Association for the Deaf and Hard of Hearing (AG Bell) in Washington, Tuesday, May 24, 2016. 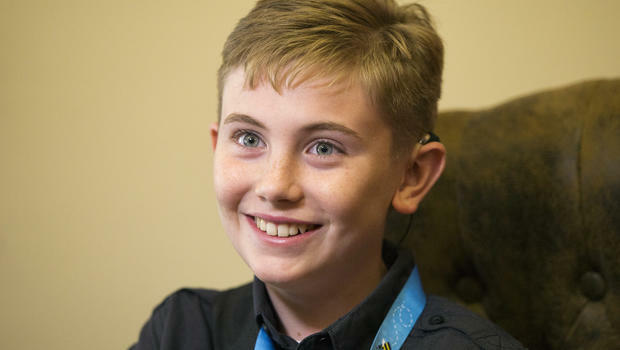 WASHINGTON D.C. — Making it to the Scripps National Spelling Bee is an amazing achievement for any kid, but for 11-year-old Neil Maes, being born deaf made his journey especially unlikely. “We didn’t even know that he’d be able to talk. It wasn’t a guarantee,” his mother, Christy Maes, said Tuesday. Now the soft-spoken kid from Belton, South Carolina is officially one of the nation’s top young spellers. He earned the right to take the stage with 281 others in Wednesday’s preliminary rounds of the Scripps National Spelling Bee. 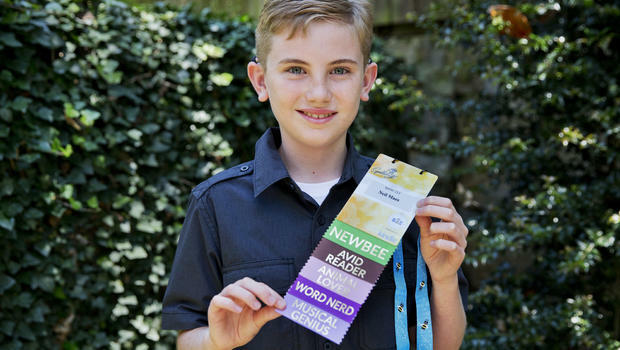 Neil Maes, 11, of Belton, S.C., holds up his National Spelling Bee badge at The Alexander Graham Bell Association for the Deaf and Hard of Hearing (AG Bell) in Washington, Tuesday, May 24, 2016. The only assistance Neil requires is that the bee’s pronouncer will speak into a microphone that transmits an FM signal directly into his cochlear implants. Similar to the technology he uses in school, it allows him to filter out background noise and focus on each word. Neil’s parents have given him another tip, coaching him to always ask the pronouncer for the definition of a word, so that he can be sure he heard it correctly. Most contestants do this anyway. Peter and Christy Maes had no experience with deafness in their families. It turns out they’re both carriers for a genetic mutation that causes hearing loss. Neil got his first implant at 11 months old. One of his two younger sisters was also born deaf, and has implants as well. Cochlear implants bypass the non-functioning parts of the ear by sending an electrical signal directly to the hearing nerve. While speech, music and other noises don’t sound exactly like they do to a person with normal hearing, the brain can, over time, learn to process those sounds in a similar way, said Dr. Michael Hoa, a surgeon at MedStar Georgetown University Hospital who performs cochlear implantations. But these implants are merely a tool, the doctor said: Neil’s intelligence and work ethic get credit for the rest. Neil Maes, 11, of Belton, S.C., center, his father Peter Maes and mother Christy Maes, poses for a portrait at Alexander Graham Bell Association for the Deaf and Hard of Hearing (AG Bell) in Washington, Tuesday, May 24, 2016. 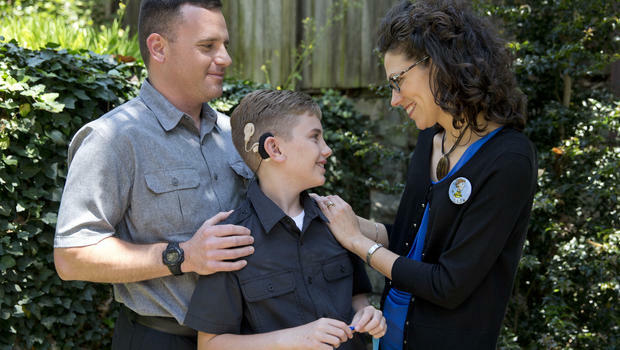 She choked up several times when talking about her son’s journey in an interview Tuesday at the Alexander Graham Bell Association for the Deaf and Hard of Hearing, a group that advocates for early intervention to help hearing-impaired kids. Neil’s parents didn’t know he was participating in a spelling bee with his third-grade class — until he came home and told them he had won. He made it all the way to his regional bee that year, finishing second. Now a fifth-grader, Neil is naturally shy and already worn out from the hectic bee-week schedule. He seemed happy to let his mom do most of the talking. “Our main hope out of all of this was to encourage and inspire people that are going to be facing what we had to face,” Christy said.